Living in San Diego has a lot of perks. For one, the weather here is darn near perfect almost the whole year. Not too hot, not too cold. Just mellow. Unfortunately there a few downsides. Most of the downsides have to do with me missing things about Ohio. Family, friends, and my extended dance family. A little background for those of you that might not know, for almost 10 years I taught Irish dancing. If you do anything for that long it is bound to become a part of you, but I find that dancing especially seeps its way into who you are. Sometimes when I’m driving I’ll start singing a jig, just to make sure I didn’t lose it (because man it took a while to not accidentally slip into a reel mid-song). Other times I catch my feet doing a dance under my seat (or more embarrassingly, while waiting in a long line). I have to admit that as much as I enjoy having my weeknights and weekends free, I’m a little sad to think that starting this week all my little dancers will be going back to class and I won’t be there. Even though Garlicky Green Beans aren’t really Irish, they are green. And in honor of my green McGing sweatshirt wearing dancers, I am posting this recipe for their first official week of the 2011-2012 dance year. Quick notes about these green beans. 1) They are ridiculously easy 2) They are flavorful, crunchy, and the perfect fix it and forget it side dish. Preheat oven to 450 degrees*. Toss all ingredients together in a bowl**. Spread green beans on a foil lined baking sheet and bake for 10-12 minutes until the skin starts to shrivel, stirring once or twice during baking. * I settled on 450 because that’s the temp my main course required. I’m sure it would be fine to use whatever temp your main course is. If it is less than 450 it will require more time, but will still work. ** For an extra flavorful punch do this about 30 minutes before you plan to cook the green beans and allow them to marinate in the oil/garlic. 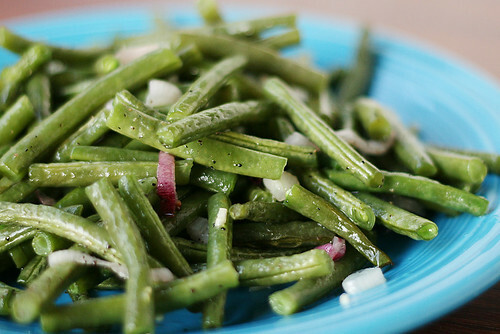 >Green beans are my hubby's favorite, I know he will love this dish. >I LOVE garlicky green beans! I can't wait to try yours. I like the idea of marinating them ahead of time, I don't usually do that. Nice picture too! >It looks like this recipe really highlights the beans, and I like that! I may have to test this one out for myself. P.S. I spent 4 years living and going to school in San Diego. The mellow weather was a huge perk! A perk that I definitely miss now. >These are so good. I make them at least once a week. Thanks for sharing!